WEEK 17: Mommy's a think-tank ! Week 17 is all about making plans and decisions. Plans about whether or not you’re going to find out your baby’s gender or the type of childbirth class you’re going to opt for. While making these decisions, your pregnancy will feel much more real and consequently get more exciting and you may feel a little anxious too! Given that you’re nearing the half way mark, you truly have a lot on your plate, but best advice is to avoid taking it all on yourself and ask for help maybe from your partner or loved ones. 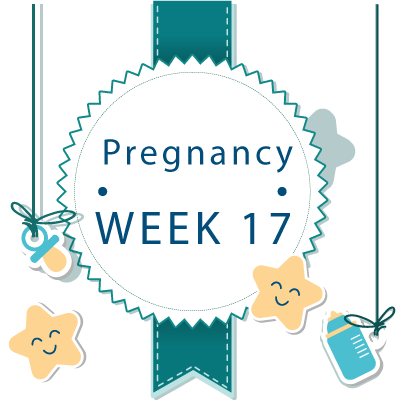 In terms of baby, it in week 17 is about the size of a pomegranate or onion, and is getting fairly active, and the kicking sensations in some cases will make this quite evident. Most of the symptoms you experience in week 17 of your pregnancy are due to your rapidly growing baby. Here are few of those symptoms that you may feel this week. Strange dreams are mostly caused by your hormones, so don’t be surprised to find yourself riding in the Batmobile or helping Barbie cook up a storm in her glamorous kitchen. Sometimes weird dreams can also be caused by your nerves or the fact that you’re waiting in anticipation for your baby to arrive. Sweat, vaginal discharge, mucus and other fluidsmay surge in production owing mostly to your increased blood flow. Given the fact that your baby is growing, your skin may feel more sensitive and get thinner. Although it may not be easy, try to avoid scratching and use a good skin lotion to ease the itchiness. By your 17th week of pregnancy, you may have gained roughly 5-10lbs, and though it is normal to gain about1-2lbs per week in the second trimester, speak to your OB if that number gets higher than that. It’s finally here! As your baby is growing so is your skin, hence getting stretch marks is inevitable. The best solution for this is to stay well hydrated, and use a good quality moisturizer to prevent/reduce them as much as possible. You may in week 17 of pregnancy feel that your contact lenses are uncomfortable to wear, so try wearing them for shorter periods of time. This is generally caused due to your rising body temperature, but notify your doctor if it gets out of hand. With regards to your belly in week 17, it is working on getting bigger to accommodate your growing baby at the rate of approximately one to two pounds per week. If you haven’t done so already, this would be a good time to start documenting your pregnancy by taking lots of photos of your belly. Considering your belly is growing, you may occasionally feel unsteady on your feet, so try and refrain from wearing high heels to reduce to risk of tumbling and causing trauma to your abdomen. When you buckle up in your car, place the lap portion of thebelt under your belly and set the shoulder harness snuggly between your breasts. 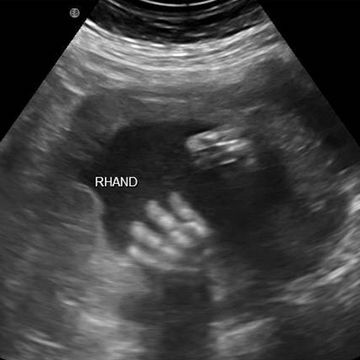 17th Week Pregnant Ultrasound - What to Expect ? Your chances of having an ultrasound at 17 weeks pregnant are pretty slim, but you may have one if you’ve opted to have a cordocentesis. This test is administered to check the blood of the umbilical cord for signs of chromosomal issues. The doctor in this procedure will use the ultrasound as a guide to locate the spot where the cord mates with the placenta, which is from where they will remove the blood. This test in most cases is performed after 17 weeks, but may be performed if other similar tests were inconclusive, and you and your partner are eager to find more definitely answers about your baby’s health. Around the time when your 17 weeks pregnant, your baby’s ears begin to protrude from its head and it begins to hear sounds. By this time, your little munchkin has gotten used to your heartbeat, your stomach growling and even the blood rushing through your veins. But that’s not all, your baby can also listen to sounds outside of your uterus such as music and even your voice. On average, most women in their 17th week of pregnancy begin to feel fetal movement sensations, but there’s no reason to worry if you don’t because you will feel them in the upcoming weeks. Considering that practice makes perfect, your baby is now honing it’s sucking and swallowing skills to prepare for that first suckle from the bottle or your breast. Your baby’s eyes when you’re 17 weeks pregnant can move, but its eyelids are still shut, and won’t open until probably week 24 or week 25 of your pregnancy. 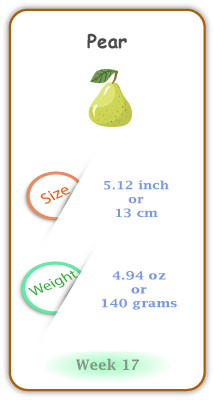 With regards to weight and size of baby at 17 weeks pregnant, it weighs approximately 4.94 ounces and measures 5.12 inches.